It’s amazing to think that there was a time back in the day that the only way of hearing Led Zeppelin’s music was via the ten original albums – ie the eight original studio albums, The Song Remains The Same soundtrack and the posthumous collection Coda. 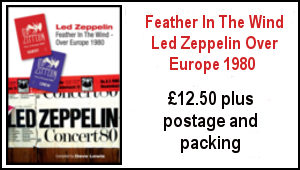 TBL CHRISTMAS GIFT IDEAS: THE TBL 2012 MAGAZINE SUBSCRIPTION – THE FEATHER IN THE WIND BOOK & T-SHIRT -KNEBWORTH BOOK SECOND EDITION PRE-ORDER – TBL 31 PRE-ORDER: EVERYTHING YOU NEED FOR A ZEP INSPIRED TBL CHRISTMAS! Fed up with receiving the same old tired gifts for Christmas each year? Why not give your loved ones a nudge in the direction of the TBL ordering page and get them to invest on your behalf –let them really know what you want for Christmas or you may well end up with novelty socks and boxers yet again. Alternatively just treat yourself! Here is a round up of TBL Product on offer this Christmas –all orders will be processed and dispatched as received. TBL PRODUCT FRENZY! THE BOOK – THE T-SHIRT – THE MAGAZINE: ORDER NOW! As previously advised here are all the details of the TBL product frenzy to set you up for the late spring/early summer. YOUR GUIDE TO LAST MINUTE TBL CHRISTMAS GIFT IDEAS! 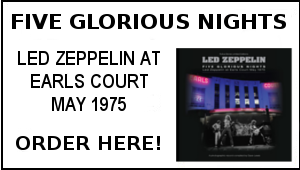 TBL CHRISTMAS GIFT IDEAS: A TBL 2011 SUBSCRIPTION – THE LED ZEPPELIN AT KNEBWORTH BOOK – ORDER NOW! Fed up with receiving the same old tired gifts for Christmas each year? 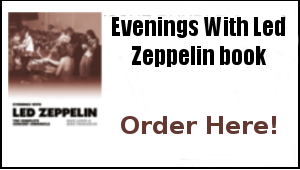 Why not give your loved ones a nudge in the direction of the TBL ordering page and get them to invest on your behalf in a TBL 2011 Subscription –the perfect Christmas gift which ensures you keep up to date with every issue of the essential Led Zeppelin magazine. 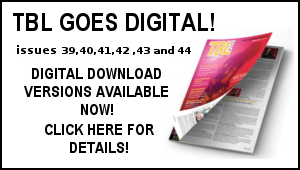 We are now accepting subscriptions for the 2011 TBL magazines. The first day cover will be franked exclusively for TBL to state from Plant Street Cradley Heath which is situated in the West Midlands. This is a unique franking stamp in association with Bletchley Park Post Office for TBL and will not be available elsewhere.